It was standing room only at yesterday’s Sequoia Grove Event 2017 at the W Hotel in San Francisco. 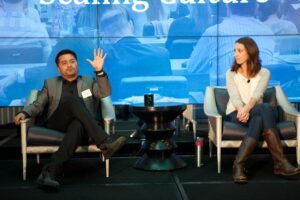 The room was filled with 115 guests and 40+ Sequoia team members and it had something for everyone, including a workshop on Building an Inclusive Workforce lead by McKendree Hickory from LifeLabs, words from Greg about our Sequoia team, a great Sequoia One update to announce key enhancements for the 2017 season, and an informative panel on Scaling Business featuring Lauren Rosenthal, HR Consultant at Connery Consulting, Dylan Allread, CPO at Doordash, and Jose Cong, Co-Founder & CEO at Plause, previously at Apple and Nest. We closed the evening with a festive cocktail party which saw lots of smiles, conversations, and the connection of our community. Please find a handful of event photos below or click here for the full gallery. If you missed the event, check back in mid April to watch the full event video.